The British spy series THE FIXER makes its U.S. debut on March 28th on KCET. It may have been a few years since its initial debut across the pond, but the American audience is sure to fall in thrall with it as well. The show features a Special Forces operative that avenged a family member’s abuse and was sentenced to prison, only to find himself re-employed by the government — albeit in a more covert capacity as a state-sponsored assassin. 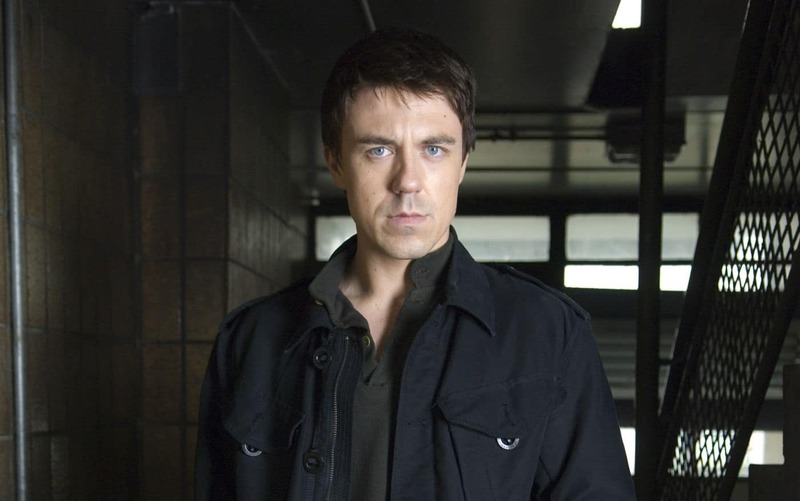 Starring Andrew Buchan as John Mercer, THE FIXER follows him as he navigates the treacherous waters of covert government ops while trying to maintain his humanity in the process. In an exclusive interview, star Andrew Buchan talks about the long legacy of THE FIXER and the global appeal of a man in search of retribution and redemption. What was the initial appeal of portraying John Mercer in THE FIXER? ANDREW: I had certainly never played a role like it before in my life. On the surface, it was a very physical challenge. But it was also a very intriguing role. The man is not just a hired-gun; he’s very much a man with a conscience. So I quite liked exploring all the various strata and the thought that was going on in his head at the time of each moral conundrum he was facing. There was never really just one John Mercer. He was never just a marching soldier. He was very much a thinker and there was an intelligence to the man. He needed to justify everything he was doing. If there was an opportunity to portray John Mercer again, like a revival of THE FIXER, would you want to do this character again? ANDREW: Funny enough, even though we are 5 years past, I get approached about THE FIXER a lot in the street from the most unlikely of people. I definitely think there is an audience for it. You definitely could not rule out a return. It was such a great cast and a huge honor to play him. You mentioned how physical the role was. Are you up for doing a role that is so physical again? ANDREW: Funny enough, THE FIXER was my first foray into the world of gyms. It kind of opened the door to the interesting world of gyms to me since that time. [Laughs] So I wouldn’t say I am in the same shape as THE FIXER, but I am certainly not a million miles away from it. So it wouldn’t be too huge or too much of an uphill climb to get back into that shape. What did you most admire about the character of John Mercer? ANDREW: Most of the roles you see in cinema or television these days, like Jason Bourne for example, is so much more interesting than just being an assassin. They do have a conscience. Nobody wants to portray someone who is just shooting at someone for no reason. They want to see them go through certain levels of justification and complexities within themselves. Real moral twists. They want to see if they will really actually go through with the kill. I think that is a much more interesting thing to play than just blank killing people for no reason, which would be hugely uninteresting television. So it is definitely the fact that this man and his mind interested me and that he had a conscience. Outside of the character of John Mercer, what was the fun part of working on THE FIXER? 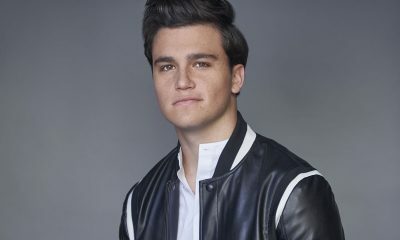 ANDREW: I’ve always compared my relationship with Jody [Latham], who played the sidekick Calum on the show, as to a “Shrek and Donkey” kind of relationship. He was just forever, forever and forever and a day in my ear, like a wasp. It was hilarious. He is just as you see him on the screen, relentless. So despite the fact that we were playing such dark individuals and dealing with quite dark material, outside of filming or between each take, there were a lot of laughs. And Peter Mullen has got a very comedic side to him as well. You’d be forgiven for thinking off the back of the roles he has played that he is a very serious man; but he’s far from it. He’s got quite a sharp wit to him and was a pleasure to be around. Jody, Peter and Tamzin were just very funny people. Sounds like you all had a great time with all the fun camaraderie there. As an actor, what do you feel you learned from working on THE FIXER? 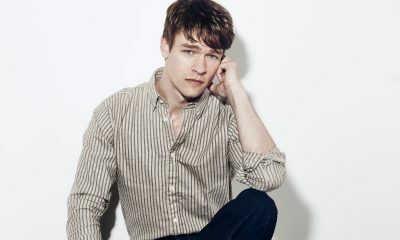 ANDREW: I remember at the time thinking: “This is possibly one of the hardest things I have been put through — and yet very rewarding at the same time.” Often people who are not in the acting industry give actors bad-press because they think actors get up at 9:00 a.m., get driven to set, and finish at 5:00 p.m. When, in fact, we are getting up at 5:00 a.m. in the dead of winter in minus 2 degree weather and running around soaked in fake blood and spend all day choreographing fights and being shoved up against brick walls and getting scrapes and sprains. It was quite grueling. So what I think I take away from a job like that is that it takes a certain level of commitment and how focused you need to be, if you truly believe in the role, in order to make it work. It doesn’t just happen. You have to be physically ready as well as mentally ready. You can’t take that lightly. You went from a very physically active role like in THE FIXER to a more emotionally tormented role like in BROADCHURCH. There has to be different levels of stress in both types of roles. Like you may have initially thought the role in BROADCHURCH was going to be a piece of cake and then you got into it and it was emotionally tolling. ANDREW: For some reason, I seem to play a character with a dark-heart. [Laughs] I don’t know why. I often play roles where I am kind of the “every man” who is put through a crisis. I think that is the best way of describing it. I’m not necessarily sure that I would describe John Mercer as an “every man.” He is in some respects. He is certainly put through a crisis, though not comparable to Mark Latimer in BROADCHURCH — that was a horrible crisis. Those are brilliant and challenging and complex roles. In looking for a common thread for your roles, it seems like the characters you portray are more self-determined. Like they want to choose their own way in situations, where other characters seem to fall into situations. So what do you look for when you choose your projects? ANDREW: I think every actor likes a challenge. Often actors, and it holds true for me as well, like to search for a role that is the polar opposite of what they just played. I suppose the obvious thing for me would be for me next to play in a comedy. Before PARTY ANIMALS, I played a vicar, and then in PARTY ANIMALS, I played a sharp and kind of sleazy political lobbyist. Then I went on to play a role that was very physical. I do try to contrast them in varying degrees every time. So I think I am looking for a contrast and a challenge and something that isn’t cheaply written. Something that challenges an audience mentality at the same time and doesn’t underestimate their intelligence. Can you share what are you currently working on? ANDREW: I think I’m allowed to say that I am hurdling head-long into BROADCHURCH Season 3. Have you been surprised at the success of BROADCHURCH? Did you foresee that it would go beyond one season? ANDREW: I don’t think you can ever predict. All you know initially that you are surrounded by a quality cast and the writing is brilliant. But as to how all that comes together, it is anyone’s guess really. It also depends on the post-production and the editing and how the music is scored. There’s so many factors that go into making it a success that is out of your hands as an actor. There’s so many more things going on that contribute to the show. So it was a complete surprise that it took off. It is so lovely that everyone has wanted to tune in and watch it. What kinds of teasers can you offer to viewers that tune in to watch THE FIXER? What can they look forward to? ANDREW: They can look forward to a drama with a very dark-heart. It explores a world of violence as played out by person with a conscience. There are so many complexities to it and within it; and hopefully — as I thinking about Calum — moments of comedy. There are a lot of comedic moments in it. It is just far from your average contract-killer. This is a man who really is in touch with his emotions. Would you say that he always gets his man? ANDREW: [Laughs] Of course he does! To see Andrew Buchan in perhaps his most iconic and badass role to date, be sure to tune in for the U.S. premiere of THE FIXER on Monday, March 28th at 10:00 p.m. on KCET.